A fortnight ago when I met the lovely Nimrat Kaur who gave me a very articulate interview for this column, she told me she is the biggest Shah Rukh Khan interview fan. She used to collect his interviews when she was in school. Many of my journalist friends agree that he always gives great interviews. Even if he makes them wait. It’s not that much of a wait for me this evening as he shows up soon enough. I ask him to show me the Happy New Year trailer and he does, asking me not to tweet about it until Thursday. The trailer has a slick Oceans vibe but done with Farah Khan’s sense of colour, style, choreography and madness. Q: So Happy New Year is a heist film? Q: So this could this be part of a trilogy of pop culture celebration that started with Main Hoon Na? Q: I met Nimrat Kaur a fortnight ago and she told me she used to keep clippings for your interviews when she was in school. My journalist friends say you are among the best interviews they have done. Do you prep for them? A: “Ninety per cent of the time, the interviews are about the film I am participating in. And when I’m doing a film, I believe in the 140-150 days of work that I have done. I believe in what I do. I believe in that thought. However random, strange, new, fantastic, good, bad or ugly it may be. That’s why I am part of it. Belief makes you articulate. Half the things people ask me are related to what I’m doing or what I felt or what I am doing next. Or how has it been? When you believe in something, there is no way you can be inarticulate about it. Q: This is my fourth interview with you in ten years. I can vouch for the rest. You have always given great interviews. A: “Well, a lot of people have an interview face. They have an interview persona. I have a party persona. I have a house persona. But I don’t have an interview persona. I am not an actor or a star when I’m doing it. I remember a joke father used to tell me about this guy, Oscar Wilde or some famous person… who always refused interviews and finally one day, one guy got an interview. He was sitting waiting for the interview and there was a door… And the gentleman just walked naked, stood, turned around naked and left. He said: I can’t give you a more internal view of myself. My logic is that. An interview means that. An internal view. So I’m not going to give you a star view. On stage when I’m performing live in front of an audience I will give you a star view. So I don’t have an interview face. I don’t have an interview prep. I say what I feel now. So it may change. Two days later, I may feel differently… and I have no issues. Q: Do you ever feel trapped in a mould you have created every time you have to spread your arms… almost in every other film? A: “I work a lot in popular cinema. So there are parameters for that. So within those parameters, you are in a mould. You play the hero type. I always have the choice to break it when I feel like and go do a Chak De or a Swades or a My Name is Khan or a Paheli or a Asoka. At least in the last five years, I’ve not gone to work because I have to. I’ve never gone to work because I need the money. I’ve never gone to work because I’m bossed around. I’ve never gone to work because there is nothing else for me to do. There is no other reason for me to work but the fact that this is really fine. And every film takes a life of its own beyond the pages that are written. Q: How do you react when critics say Shah Rukh Khan is Shah Rukh Khan in every film? A: “I downplay my acting prowess. I don’t take myself seriously but that does not mean I’m not a serious actor. I say I have five expressions… because I like to play it down. Q: People say the same about Rajinikanth too but do you need to act is the question. 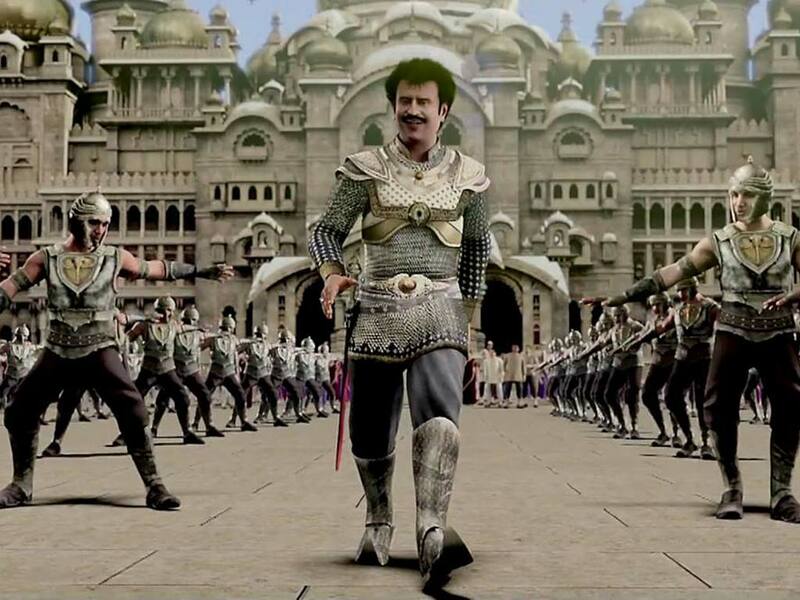 A: “Rajinikanth is a superstar. I am not a superstar. I need to work, I need to reinvent, not just myself even the cinema around me because I can control that. So when someone asks me: Can you do a comedy? 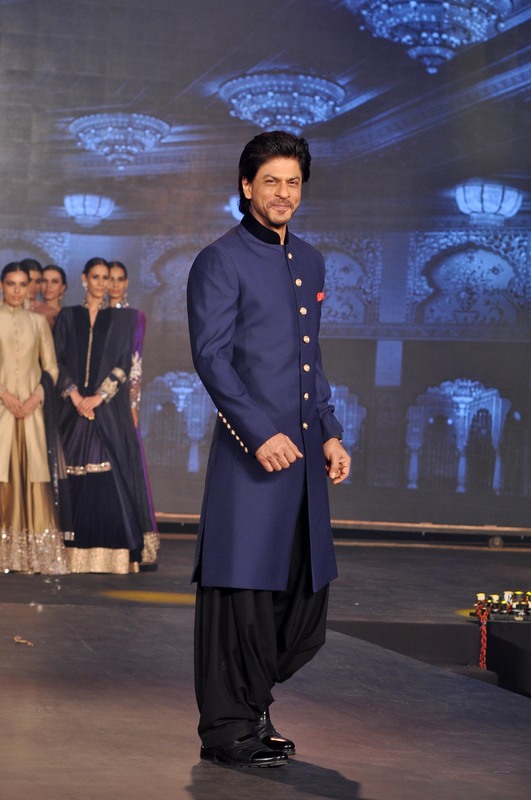 The last one I did was Baadshah. So I thought I’ll do a retarded comedy and do it in the mould people like. I didn’t think I’m an actor of that genre. Let me pull all the reserves I have and let me get into that world of Chennai Express. Before that it was Jab Tak Hain Jaan, which had to be done in a certain poetic style. To convince people that such a man exists. It is a love story… a triangle between God, a woman and a man. Of course, the arms will rise because it is popular cinema. Of course, the romance will still happen because it is popular cinema. To be honest, Swades, Chak De, Ashoka, Paheli… easiest films to make. Because being real, being honest is easy. Just sitting there and depending on the line, the words, your eyes and just the story is much easier than believing in a dream which is unrealistic and unachievable. I am going to mess with God. I will fly with electricity. I will win the World Dance Championship. It is a huge leap of faith for an actor to believe he can pull these things off. As an actor, put me in a real space and 80 per cent of your job is done. You put me in a hockey field and I am a coach. You put me in a space in the world your film is set in and I don’t have to do anything. But unreal characters are totally dependent on your dream and your belief in them. Autism is a difficult thing to do but you know that space. You’ve met people like that. Devdas was easy to play because all men are like that. Q: Like veteran French screenwriter Jean Claude Carriere says: Fiction sometimes goes deeper into the truth than fact. A: “Fiction is wanting to achieve your most deep-rooted desires. 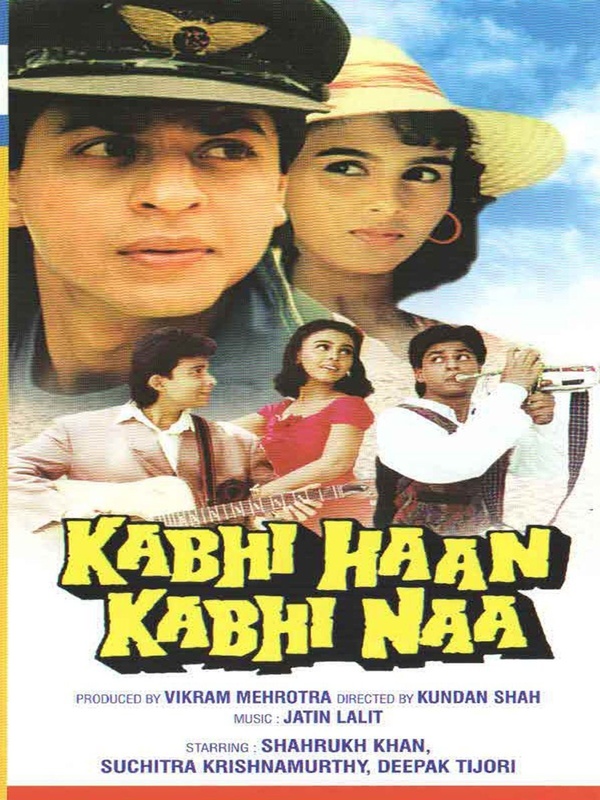 Q: Would you say that’s why Dilwaale Dulhaniya Le Jayenge is still playing at Maratha Mandir, in its 20th year… because manufacturing consent of parents for their love story was wish fulfillment of a desire of the younger generation? Q: I’m sure you have had 20 years to think about why that film resonates so much. Q: Is 300 crores the new benchmark for films to surpass where success is measured through box office collections? Q: How do you think you have changed over the last 25 years, temperament wise? Q: Aren’t people just the same and hence, all stories the same too, at some level? Q: Now that you have admitted all stories are same, how different is Happy New Year? Q: So does you see yourself as a winner or a loser? Q: That’s why you go beyond the call of duty entertaining people. A: “I hope they go back thinking that I have entertained them… that’s winning to me but that doesn’t last more than 4-5 days. Nothing lasts for posterity. Nobody remembers anything, people don’t remember parents. When Pyaasa released, they panned it. You don’t make anything for posterity. Your time in space is where you are. Nothing else exists. I don’t have any nostalgia. I’m not 75 and when I’m 75 why would I watch my film. Celluloid is amazing but it’s not life lasting. Indian television’s biggest fiction show starring Amitabh Bachchan, Kay Kay Menon, Zakir Hussain, Aahana Kumra, Mona Wasu, Sarika, Tigmanshu Dhulia, Ayesha Raza has aired eight out of the 20 episodes from its very first season on Sony Entertainment Television over the last two weeks (Monday through Thursday, at 10.30 p.m). The 140-crore budget show that boasts of Anurag Kashyap as the showrunner, also had Shoojit Sircar on the sets to supervise the efforts of director Ribhu Dasgupta, given the scale and stakes involved. And after a slow and rather weak start in its first week, the show surely has picked up some momentum during its second week. While it gets a lot of things right and is certainly a lot better than most shows on Indian TV, Yudh is still frustratingly average fare with bursts of good moments. The performances – led by Amitabh Bachchan himself – are refreshingly realistic and the ensemble shows restraint. Full points to the series creators for infusing Indian TV with this long lost sensibility. Even the camera work is quite mature (none of that gimmickry Indian TV has been cursed with), the production values better than most shows on TV and while the show is fairly fast-paced strictly in the context of Indian programming, it is still half as slow as American shows. While shows like Breaking Bad and Lost earned their licence to stall in only the mid seasons, Yudh takes the audience for granted quite early on, making many give up after the first episode or two. There are a few things that don’t work though. One, the show takes itself way too seriously which is laughable because it’s quite a pulpy script… full of conspiracies, twists and turns, most of which seem forced, convenient and almost soap operatic. The show is devoid of logic with its protagonist making the most ridiculous decisions right from Episode 1 and yet, the director shoots it like it’s a character study. Downright pretentious in treatment. Two, we have a protagonist who does the most ridiculous things. If Yudh (Bachchan, of course) takes an anonymous tip-off as the word of God in the pilot and evacuates a government hospital all by himself, he is silly enough to call for a press conference based on another anonymous CD sent to him as evidence without any fact-checking or verifying the sender’s motive. Despite his growing list of enemies and increasing stakes and danger, it never occurs to Yudh to check on (or wonder about) the safety of his trusted efficient aide when she doesn’t take calls, especially during a crisis she had to fire-fight. How do we root for this dim-witted dying protagonist who seems full of self-pity, who always makes bad decisions on an impulse, one with no redeeming quality except that he’s supposed to be a good man. Yet, we are not sure. Every time his solution to a problem involves making more enemies. For a man who shouldn’t stress, he is asking for new problems. Even the negotiator in a kidnap gets annoyed with his behaviour and blasts a bomb in his mine to teach him a lesson. Well played, Yudh. The show ought to have been called How to make enemies and piss off people. Then, Yudh is so full of Amitabh Bachchan as its centerpiece that when the narrative cuts to the subplots and stories of other characters ever so briefly, they seem irrelevant and seem to be put in as token sub-plots (We almost forget Tigmanshu Dhulia is in there) There’s just not enough about the rest for us to care. And because he can’t do many stunts, most of the action in this thriller is largely indoor and fresh conflicts arrive through phone calls and texts. Show, don’t tell, remember? Even the few outdoor stunts shown look tacky, given the budget the show boasts of. Finally, the frequency of the show itself. Four days a week with an hour a day is high maintenance given that very little happens everyday. If we were to tightly cut two episodes into one, this might have been a good ten-episode long first season. But this is just odd pacing that requires too much commitment and patience. Luckily, the show is online on Youtube. You can just skip to the parts that make sense. 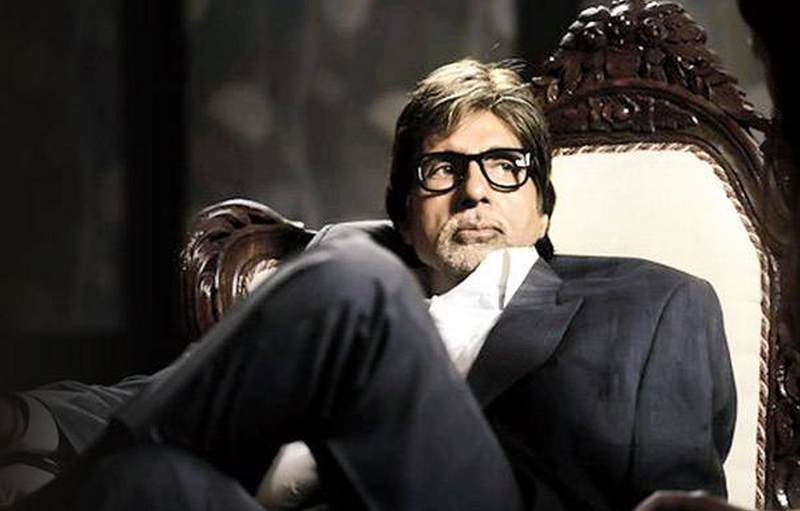 Given its current format and structure, Yudh is best caught online. About six years ago around the same time, I met New York. I had just the script for it. A conversation film that I had just written with Shilpa Rathnam simply because my friend Nischalakrishna Vittalanathan bought a Sony HVR V1U (He had spent a year discovering everything it can do and how to optimise it for shooting movies) and had insisted that I write something we can shoot quickly. The pop culture references were mostly American since we had written it in English and it didn’t seem to work when we tried to localise it. (We’re still trying to do it, though!) Besides, this was a New year’s eve film in English. New York sounded like the perfect world for it. Raja Sen was one of the first people to read it, a month after we started writing it and asked me who I had in mind for the cast. I was planning to shoot with newcomers. He was on the opinion that this script has so much potential that I should consider casting someone from Bollywood. He put me in touch with an actress who loved the script enough to say she would do it. I had heard of Manu Narayan from Kaveri Valliappan, a choice strongly recommended by my best friend from school Murugan (they are both from Pittsburgh; Murugan had seen Manu perform in Andrew Lloyd Webber & A.R. Rahman’s Bombay Dreams in Broadway, New York). So New York it would be. We would shoot on New Year’s Eve. We would be there around Christmas and stay on for three weeks to wrap shoot. That was the plan. But thanks to problems small filmmakers face with big stars, I ended up with just the first four minutes of the film. And I was going to leave New york, having spent the three lakhs more than the ten lakhs I had budgeted for the whole film – WITH NO FILM! Just some great memories. The Pizza at Artichoke. Hot Chocolate at Max Brenners. Experiencing snowfall for the first time in Queens… while shooting it. The madness at Times Square on New Years Eve… Getting so sloshed to keep ourselves warm and almost surviving the night. Ask Raja Sen for the story of that legendary night he remembers only from accounts of other people… Going to Red Bank, New Jersey to see where Kevin Smith shot Clerks on his birthday… Living in a suite at the New Yorker hotel (where we were supposed to shoot) for a week… Shooting an obscure music video with our actress that had nothing to do with the film because our film shoot was not going to happen. In between these highs and lows, I thought about how they did it back in the day before outdoor shoots were not logistically possible. The fifties. And it dawned on me that if I could do the same, I could probably be able to shoot the whole film in India if I went all the way and embraced everything the fifties were about. So in that one week I had left in New York, I decided to salvage the best out of that situation. I hired a helicopter, got all the aerial shots I needed from New York to halfway to Philadelphia. I rented a taxi halfway between New York and Philadelphia and shot all around New Hope. I shot every possible outdoor shot I needed. I sourced every prop I needed to stay true to the milieu. The radio announcements on December 31, the newspaper of that day, the hotel supplies… We even stole their menu. All the outdoors could be projected outside the static car inside a studio… and it would work great in a black and white film. We hadn’t started off trying to make a black and white film but this seemed like the only way out. So we rewrote the film to make it sound more like the fifties. More mushy. More cheesy. We sourced the right kind of jazz music – from Ray Guntrip in the UK to Gregory Generet from New York to Manu Narayan’s bandmate Radovan Jovicevic to Chennai based Maitreya to do a cover of Strangers in the Night. I just need money to shoot. And to pay off the credit card and personal loan debts from the 13 lakhs I had already spent. To cut a long sob story short, it took me 18 months to get back on my feet and shoot again. With more personal loans and fresh credit card debt. The actress who was to do the film wasn’t available anymore because of both health and date issues but this turned out to be a blessing in disguise because we found the incredibly talented Seema Rahmani… who I had messaged through Facebook after being impressed with her American accent in Loins of Punjab. She didn’t share her number. She texted back her email address and said she would call IF she liked the script. Two days later, she did. She didn’t even want to talk money. It had connected to her at a very deep level. She called me every day to go over the lines until she came to Chennai three weeks later for the shoot and by the time she landed, she knew every single line of the script by heart. It was a craziest of schedules. We put them up both at a service apartment for a month and even shot a few scenes there. We shot all of Seema in three days flat, all of Manu in two days and the five episodes in between the phone call in another four days. Including patchwork, we shot maybe ten days in all! We had just finished edit and before we could figure out what to do, Megha Ramaswamy saw the film at Raja Sen’s place and recommended it to Galen Rosenthal of the South Asian International Film Festival, New York. It seemed like the place to premiere the film being the home of the film. We also got a call from the Mumbai Film Festival. So we had back to back premieres in a week. Mumbai first and then, New York. Finally, AFTER the premiere, I was able to reshoot and replace a few shots from the first four minutes with Seema Rahmani walking down streets of New York (I had used the shots of the previous actress in silhouette for the premiere). Manu’s Mom came for the premiere. She was moved to tears with the performance of her son. I would always cherish that night Manu got so emotional and said he found a brother in me. For life. I love that guy. For sticking with the project and believing in it. For years. An American premiere was also the perfect excuse for me to go all the way to LA. I was hoping to meet my idol Cameron Crowe to give him a DVD of our film – because we had written it as that ten minute phone call from Elizabethtown coming to life. But that’s another story. We then got invited to the Habitat Film Festival, Delhi and Shiladitya Bora, who was programming alternative content for PVR happened to see a poster of the film there that got his attention. He wrote to me asking for a DVD and offered to release it through his new banner Director’s Rare. That was the beginning of another great friendship. 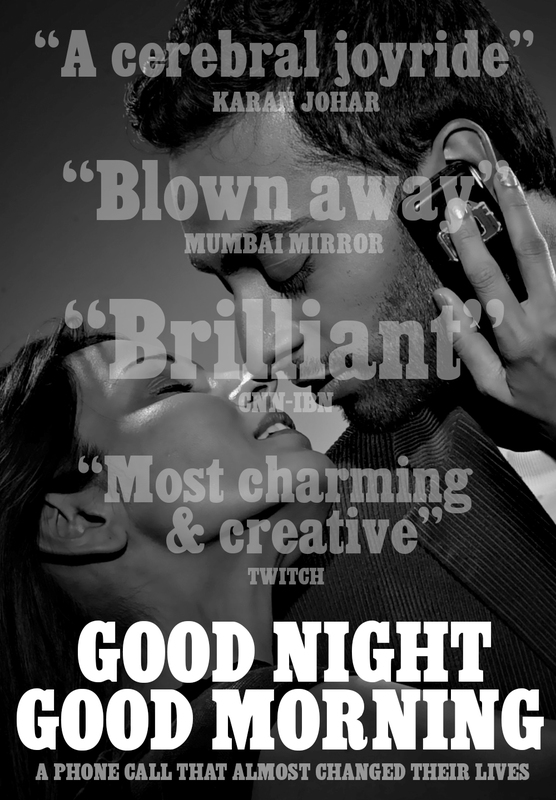 On January 20, 2012, PVR launched its Director’s Rare banner with Good Night Good Morning. We sold 1500 tickets through 18 screens. It was a total disaster at the box office given. We hadn’t spent one rupee on marketing or publicity because I had already spent 30 lakhs on the film and was too broke to spend any more. I wrote an angry rant back then that got some people interested in the film and luckily for us, the reviews were good too. Full credit to Shiladitya Bora to keep the initiative going and Director’s Rare today has released about 60 films since Good Night Good Morning. He had opened up and created a niche market for films like these. Our share from PVR was Rs.99000. We got another Rs.25000 from Sathyam Cinemas from Chennai. Mela gave us Rs.50000 for an online release. And Enlighten sold 1000 DVDs that got us another Rs. 60000. So I had spent 30 lakh rupees and not even recovered three! We are still waiting for a decent deal for a TV premiere. I still have three more months of Good Night Good Morning debt left. I still need to pay my best friend Murugan $9000 dollars. I reminded him about it last week. He said even if you make it back, I want you to put it in the next film. Thankfully, I don’t need to take on the extra baggage of producing anymore. And the market has opened up too. There are some excellent modern producers and we found one such angel investor in Manish Mundra for X. But this is not about X. This is about closure for Good Night Good Morning. A film about closure. So guys and girls, the film is finally out there online. For posterity, hopefully. In all its HD detail. You can buy it or rent it for Rs.25 on Google Play. It should be out on Amazon and iTunes soon. Maybe in twenty years or so, it would actually recover its cost. If you want to help, do spread the word and pass this link to your friends. It’s not a bad film at all, I promise. There’s a link to the director’s commentary online as well that I recorded at home if you want to hear more about our adventures with low-budget filmmaking.